Life can be hard at times. Sometimes it seems that we’re surrounded by storms that just get more and more difficult. Almost like a hurricane. Ancient mariners would throw out their anchors to keep them from being blown off course. What are your anchors in life? What do you rely on to keep you on course? 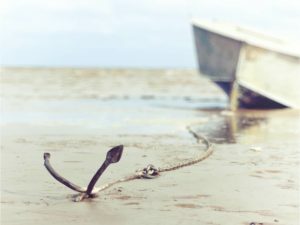 The writer of Hebrews points to our hope in Jesus as the best of anchors. When everything around us is going crazy, we might begin to wonder how things will turn out. Yet, when our hope is in Jesus, we actually know the end of the story. The story of our life ends with Jesus. Heaven is a pretty great “happy ending” in my eyes. Heaven is “behind the veil”. Heaven is being in God’s presence. Heaven is a sure thing when we have come to trust in Jesus. Again, I would ask: What are your anchors in life? What are you counting on to get you through? Put your hope and trust in the One who gave His life for you. Put your hope in the One who conquered death and rose from the grave. Put your hope in the One with whom all things are possible. You can ride out this storm.